Now that you have decided whether to send you child to Boarding, Day-Boarding or Day School, it is time to understand the different education boards and curriculums available in India today. On the eve of India’s 68th Independence Day, the hunt for the right school for my daughter brings me to explore a British education board - IGCSE and another adapted from the British - CISCE (satirical isn’t it) along with the Geneva-imported IB board and our indigenous CBSE and State Boards. While I may not be able to live up to Mahatma Gandhi’s swadeshi movement of boycotting British goods to remain unbiased for this analysis, but I can certainly assure of non-violence in the spirit of our Independence. Born in a country where parents have wanted their children to first become engineers or doctors and then figure out what their children may wish to become, I try to develop an understanding of the destinations the possible paths (i.e. different educational boards) are likely to lead our children in today’s educational scenario in India. In this blog, I try to draw out my understanding of the similarities, differences, advantages and limitations of the different options available. India follows a “10+2” pattern for school education. I would like to give a word of caution to my readers at the start: the decision on the choice of education board is relative to where your child is currently in this 10+2 pattern, so please exercise your own judgement with my arguments and verdicts. CBSE: About 15,000 affiliated schools in India and 24 other countries making it the most popular board in India. CISCE (ICSE, ISC): Approximately 1,900 affiliated schools in India making it the second most popular board in India. State Boards: Affiliated schools are restricted to state in which board is established. IGCSE: 310 affiliated schools in India and over 10,000 schools in 160 countries making the most popular International board amongst these. IB: 111 affiliated schools in India, 51 of those offer the Primary Years Programme (PYP), 11 schools offer the Middle Years Programme (MYP) and 99 schools offer the Diploma Programme (DP). In all there are 3,875 IB Schools in 148 countries. Let me debunk two myths at the start. Unlike popular belief, all the four boards discussed in this blog have been awarded acceptance by Indian Universities (yes, you heard that right and that includes IB). Second, taking up an international curriculum does not put you ahead in admissions to international universities in any direct way. For parents looking for the short answer, here it is – CBSE may be best for pursuing engineering and medical streams within India in later years. State Boards may suit students looking to stay on and work within that state post their education. CISCE (ICSE / ISC) may be good for students looking for more holistic knowledge without the spend of an International curriculum. IGCSE is only applicable for 14 to 16 year olds looking for a flexible International curriculum. IB may be suited for students wanting more than a standard academic focused Indian school experience while allowing good International mobility. In terms of examinations state curriculum is usually content based, the CBSE exams are application based, and the ICSE, IB and IGCSE are knowledge, understanding, application and skill-set based. To provide a sneak-peak of my understanding of how these work in practice: CBSE curriculum will usually offer a pre-set combination of subjects geared towards specific career goals; CISCE (ICSE, ISC) will retain some of those properties while providing a bit more flexibility by adding some volume to the course; State boards will be narrower in focus; IGCSE will offer foundation courses to all with an option to gain deeper knowledge to students with the right aptitude in the subjects while allowing others with different abilities to explore other interests; IB will offer deep knowledge and experience in courses of your choosing from defined subject areas. One sweet tooth I have, don’t I! But I hope you get the point with my sundae mania. Below are more specifics about each of these education boards / curriculum to validate my short answer and I have to say that it is a must to read on to understand my real perspective of these boards in India. CBSE or Central Board of Secondary Education is the most popular school board in India. My verdict on CBSE for Indian students: I find CBSE board as one to be universally applicable to every student in the Indian context. It is thus competitive or result (exam) oriented in its approach. Its strong Science and Math focus make it an ideal choice for pursuing India based higher education in medical, architecture and engineering fields. You can see the list of popular CBSE schools in the Gurgaon region at SchoolWiser. CISCE or Council for Indian School Certificate Examinations was originally setup to adapt the University of Cambridge Local Examinations to the needs of India. My verdict on CISCE for Indian students: I find CISCE (ICSE, ISC) as a board with pedagogy borrowed from the University of Cambridge and then blended with Indian ethos giving it the International flair within the Indian context. It is thus skills development, independent research and creativity oriented in its approach making it a close proxy for international curriculums. Its focus on language, art & science and wide recognition worldwide make it a good choice for students looking to pursue management and humanities based higher education in India or aboard. You can see the list of popular CISCE (ICSE) schools in the Gurgaon region at SchoolWiser. My verdict on State board for Indian students: Choose this only if you have to especially if school expense is a guiding force. IB or International Baccalaureate is a board founded in Geneva, Switzerland. In contrast to the Indian boards, IB assesses student performance against set standards and not by comparing them to other students taking the same course. My verdict on IB board for Indian students: Its early years for IB in India and I expect many of the primary issues to be ironed out by the time students entering PYP apply for university. It sounds like an excellent recipe to develop well rounded individuals if you have the stomach for it (or better - the pocket for it). As it currently stands - Once in IB always in IB including high likelihood of pursuing university education abroad. 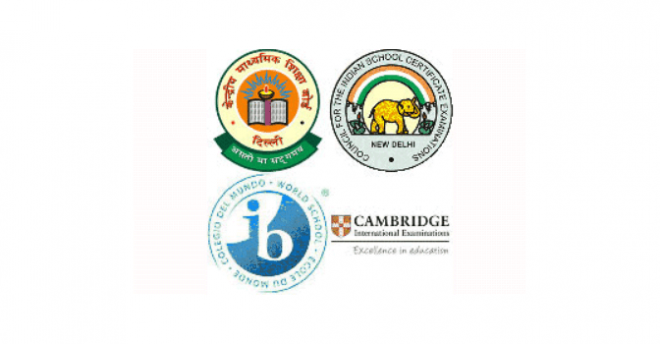 You can see the list of popular IB schools in the Gurgaon region at SchoolWiser. IGCSE is the world’s most popular international curriculum for 14 to 16 year olds developed by the University of Cambridge. It starts with a foundation of core subjects allowing addition of breadth and cross-curricular perspectives and concludes with IGCSE assessment conducted by two UK assessment bodies—Edexcel (also known as London Examinations) and Cambridge International Examinations (CIE). My verdict on IGCSE board: IGCSE seems to offer an excellent student-centred curriculum to a wide variety of children of different abilities. It has adequate academic focus and develops skills in creative thinking, enquiry and problem solving, giving students excellent preparation to succeed in +2 years and the life ahead. So I would think - If IGCSE is an available option, it would make sense to grab it in most cases. You can see the list of popular IGCSE schools in the Gurgaon region at SchoolWiser. To conclude my analysis of the different education boards in India, I would like to mention that while choosing the right board is pertinent; it boils down to the actual school and their interest level in teaching the child than the syllabus itself. So it is important to examine if the school is true to the board it follows. One school of thought is to choose a school and/or board for life while the other is to shift based on the needs of the child. For example, for someone not particularly gearing to become an engineer or doctor, a possible direction could be starting off with a CBSE or CISCE (ICSE, ISC) curriculum till grade 8 and then switching to IGCSE for grade 9 & 10 and then finally going on to complete the IB Diploma Programme. This will offer the standardisation of more traditional curriculum in earlier classes, the solidness and acceptability of the most popular International curriculum and the flexibility and breadth in the most senior classes. To achieve something like this one would need to look for a school that offers IGCSE and IB Diploma Programme as options in higher classes or shift schools at those junctures. To contrast, people who have their eyes set on the engineering or medical degrees, the variation could be a full CBSE curriculum throughout or with IGCSE just during the 9 & 10 grade for more completeness and switching back to CBSE for their +2 qualification. There could be several other such combinations to cater to specific needs and it is finally up to us parents to decide what is best for our child based on what we and our children want from an education – a demanding task indeed! Liked what you read? Spread the knowledge by sharing it with others. We also encourage all parents with school going children, teachers and current and former students to to provide your perspective on the curriculum you or your child has studied with other parents through the discussion below. Thank you for your participation, I am sure all parents will appreciate it.